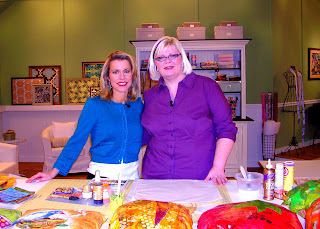 Here I am with Pokey Bolton (she is the small, adorable one, I am the giant), on the set of Quilting Arts TV. Everyone is incredibly wonderful to work with and they bend over backwards to ensure your success. Helen and Catherine were tremendous helpers. I wanted them to come home with me. That goes also for the make-up artist, who had a giant case of delicious Mac cosmetics. Kathy Stull makes the magic happen from the booth, and she whispers all sorts of things to the camera and sound guys through their ear mikes. They're probably telling dirty jokes while those of us on camera are sweating! It was great working with the Bernina whiz Jeanne, who introduced me to her machines and swapped needles for me. The sewing machine I used was incredible--there were floodlights on my work and I could actually SEE what I was free-motion stitching. Woot! My own sewing machine is in the shop, booooo...hoooooooooooo! What a beautiful set. You and Pokey compliment one another in your choice of colors to wear! Looks like you had a lot of fun taping your segment. I wish our time there could have been at the same time or overlapped in some way. Glad it all went well. Wasn't that Bernina sewing machine amazing! Way to go Kelli! I'm sure you did an absolutely wonderful job. It was wonderful to get to know you and I surely hope we have the opportunity to meet again. You are an amazing woman!